After about a 90-second replay review, the game umps, the replay officials and all 4 of the Illinois governors that are in jail, determined that the Chicago Cubs catcher was NOT blocking the plate for some reason. I guess their definition of “blocking” has more to do with building stuff out of Legos than it does with a catcher straddling the straight, white baseline that leads directly to home plate whose path seems to appear to be “blocked” by a LEG dressed in Chicago Cubs baseball equipment. This new rule is a more loosely interpreted than how many Hail Mary’s, Our Fathers and Act of Contritions the local priests used to give when you confessed the same sins every week in the confessional….i.e, “I swore. I took God’s name in vain. I disobeyed my parents.” If the priest was cool.. you’d say one of each. If the priest was having a bad day, you might have to say 5 of each. So, what’s YOUR thought? Was he out or should the Pirate’s have scored a run there? 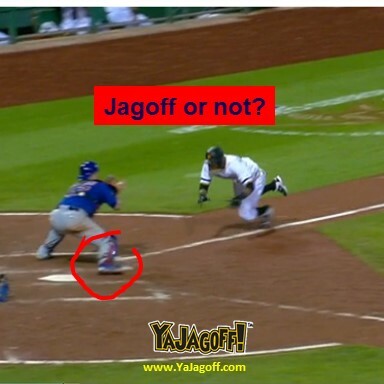 The home-plate ump and the replay officials… are they Jagoffs or Not? By the way, we offered a chance to win 2 comp tickets to Pierogi Fest this Saturday at Stage AE yesterday on Twitter and Facebook. For the 1,827,021th time, The Airport Rules!